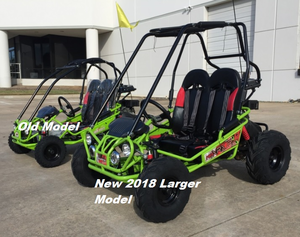 Home » GO Karts - Dune Buggy's » *50cc to 163cc Youth Go Karts & Buggy's » Trailmaster NEW Ultra Mini XRX+ Go Kart - Wider Frame, Wider Seats, More Leg & Headroom, Taller Roll Cage, Bigger Tires! Trailmaster NEW Ultra Mini XRX+ Go Kart - Wider Frame, Wider Seats, More Leg & Headroom, Taller Roll Cage, Bigger Tires! BRAND NEW 2018 MODEL!! BEST QUALITY KIDS KART WITH BIG TIRES AND LARGER FRAME!! SPECIAL = Get a Free Pair Youth MX Gloves + Goggles + Gear Bag! A $39-value, 3 Great Gifts FREE with purchase of this Youth Go Kart! Motobuys is proud to announce our new ASSEMBLED - READY TO RIDE OPTION! Let the pro's assemble your new Go Kart, it will arrive to your door built right, run tested and you only put on the roll cage and steering wheel, then put gas in it and go riding! The Trailmaster Mini XRX+ Go cart is the perfect kart for young riders and is built with great safety features. There is a speed limiter on the gas pedal. Max speed is 12.4 M/H. You control the speed until the rider gets more experienced. The Trailmaster Mini is made to ride two kids and provides safety belts for both. 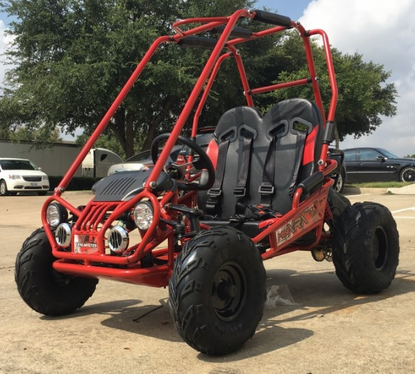 The Trailmaster Mini XRX+ Size (ages 4 to 12) double seat, full suspension Go Kart powered by a 163cc, 5.5 hp Engine and features 2-wheel drive and centrifugal clutch. This is an Xlint quality cart that offers all the popular features found on much more expensive karts. * Light Kit Package! * Dual Seats! * Seat to Pedal Measurement 30" - 35"
* Adjustable Pedal can also adjusted to 3" or 6" shorter. Pedal to certer seat back: 30" to 35"; Pedal can also adjusted to 3" or 6" shorter. OFF ROAD: ATV'S, UTV'S, BUGGIES, GO CARTS AND DIRT BIKES offer 3 MONTHS PARTS, 6 MONTH ENGINE WARRANTY, MOTOBUYS.com will supply new or rebuilt replacement parts in exchange for defective parts for a period of 3(three) months, as well defective engines for a period of 6(six) months from the date of purchase at no charge.